Honestly, I feel as if I've talked your ears off on this little guest house renovation of ours so I'll keep my comments brief! The electric fireplace makes the kitchen feel like a whole new space. 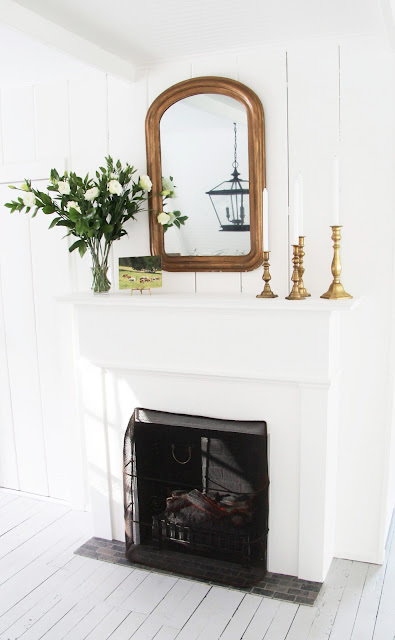 The heat is wonderful of course, but the coziness of sitting in front of a fireplace... there's something about a mantle and a hearth that just feels good. The pedestal table was an Amazon purchase. 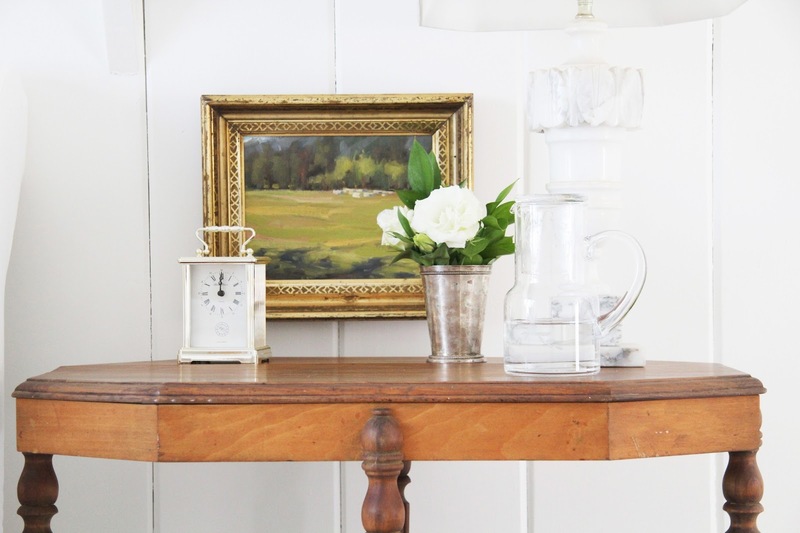 Of course, I wanted to find an antique table, but the criteria for the qualities that this antique table would have to possess made the task quite impossible... a pedestal, warm wood color, 42" diameter, affordable... This table was actually unfinished so we played around with several stain/seal products on the underside until we found the right hue. The IKEA arm chairs came from our house. They actually don't make them anymore, which is something I discovered when Country Living asked me to source them. As always, there's art in the kitchen. It's such a treat. These oil paintings are by artists Cathleen Rehfeld and Eric Jacobsen. The oak butcher block counters are from IKEA. 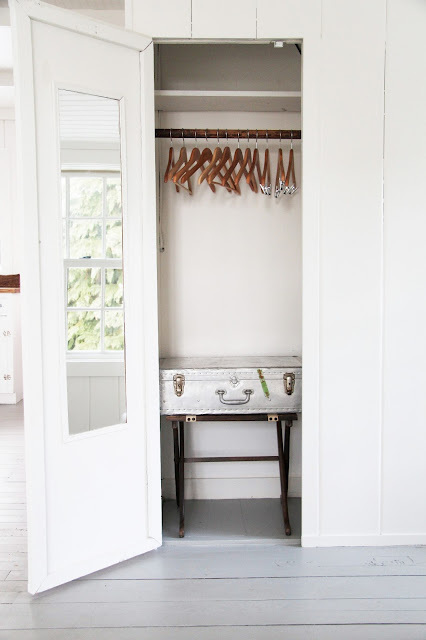 The pulls and cabinet hinges transformed the original 1960s cabinet into the style of a yet older cabinet, from the 1930s. The logs and light show up much better in person that in this sun lit image. It's obvious that it's not a real fire, but still offers a coziness that's a wink and a nod to the real thing. The Louis Phillipe-style mirror is one I bought for $35. I have so many mirrors, (and I'm quoting my husband there) it's hard to believe that I can still find ones to buy. But this just seemed like the perfect mirror for over the mantle. 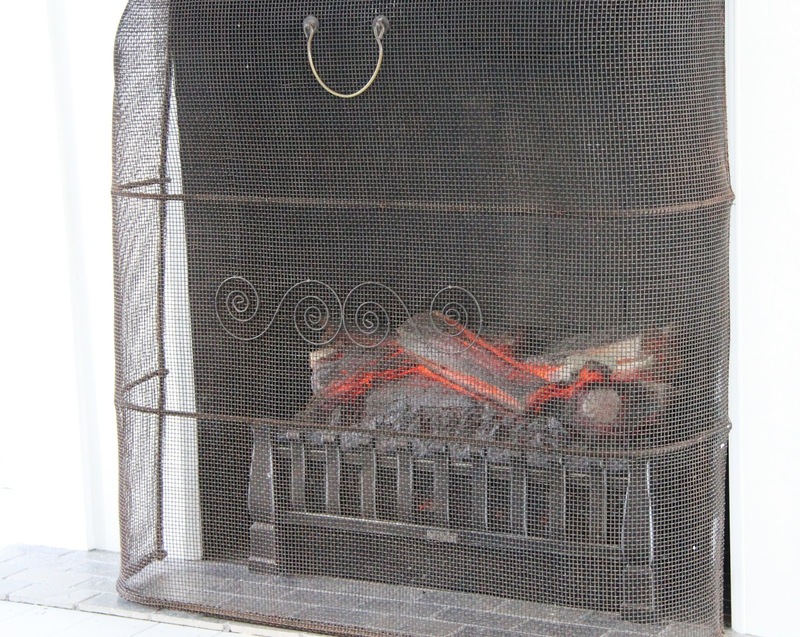 Here is a close-up of the inside of the fireplace. Covered with an antique fireplace screen, it looks a bit more realistic. I still need to buy a rug for the bedroom. 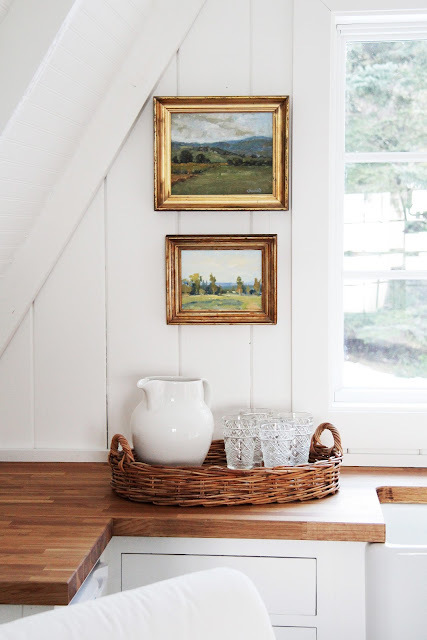 The rug that was featured in the Country Living shoot was borrowed from Crate and Barrel. The IKEA bed was the result of a panic that I had late one night (a few days before the shoot) when I realized that things weren't coming together quite as hoped (I intended on using an old wood bed, but the hue was too dark). I had shopped for upholstered beds at Ballard's months earlier but ended up passing on them because they were beyond our budget. The IKEA bed was a good compromise. This night stand is one I found last summer for $30. I liked it because of the warm wood tone, and knew that I was going to try to use pieces with a similar feel throughout the space. I didn't have two matching alabaster lamps, but I used two that are pretty similar in height. I married them with matching linen lamp shades, using appropriate hoops and spacers to make them the same height. The Chippendale reproduction mirror came from my mirror collection. I must have paid about twenty dollars for this one. 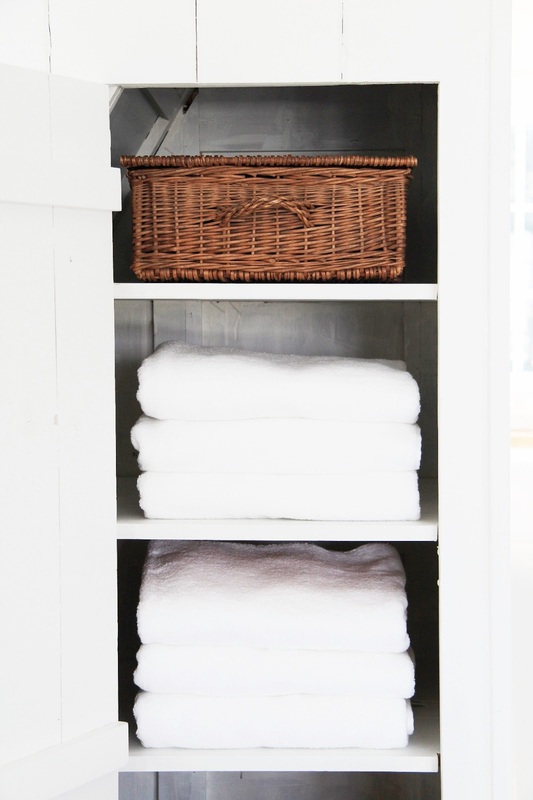 Here's a sneak peak inside the linen shelf closet. And here's the hanging closet. I found this plant stand for $20. It's the perfect size for the tiny little bathroom. 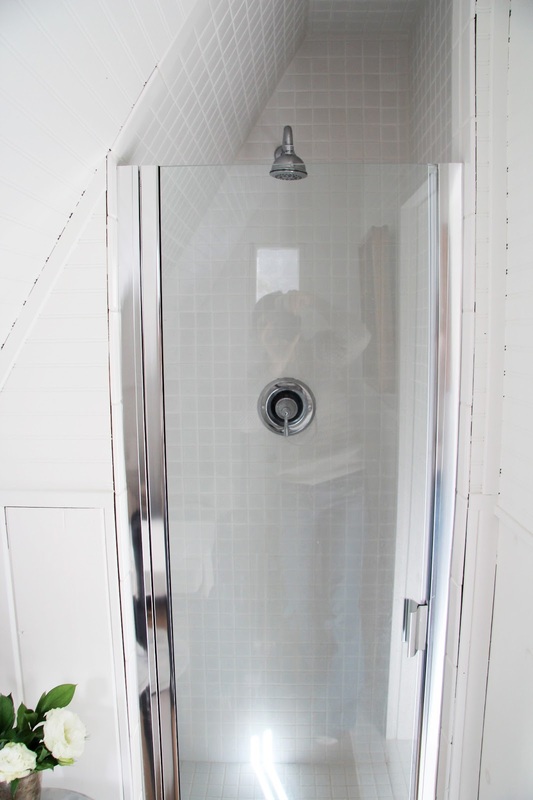 We tiled the bathroom floors and created this enclosed shower years ago. I wish I had taken a picture of the original bathroom. It was horrible. When we lived in the guest house during our first several months on the property (as we completed the first wave of renovation to the main house), I wouldn't shower without wearing flip flops. It was that bad. For those who inquired into that gorgeous couch that was shown in the Country Living feature - it's not here anymore. It was brought in on loan from Rejuvenation as my Grandmother's antique federal couch that I intended to use wasn't going to be ready in time. In fact, it's still in storage in our barn as I haven't been able to shop for or decide on a fabric to reupholster it with. Technically, I have one more post to do - the exterior. But I'll take a break from this project of ours (for your sake) and perhaps take some exterior photos when the snow melts in a few weeks. so lovely... I would love to be a guest in this little house...so cosy! A perfect guest room, I would LOVE to stay there. Your guest will never want to leave.....be careful!! Such a beautiful space - you've done a lovely job! Amazing as always Trina, and truly I love all the details! The more the better! You are amazing Trina!! Love everything you do. Thank you for sharing such lovely photos. I would love to be a guest!! 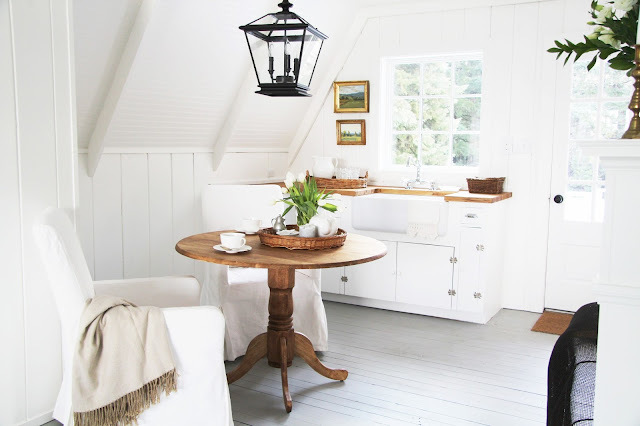 Love, love, love that light fitting. What a warm and welcoming spot you've made----I love everything about it but the fireplace sure made a difference! I looked forward to and enjoyed the Country Living photo shoot of your guest cottage . . . however, I enjoyed your photo shoot (s) even more. 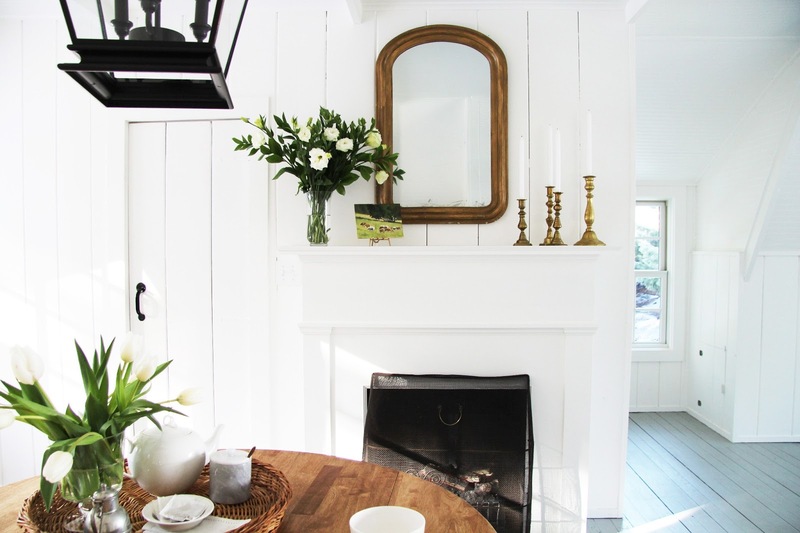 Your guests will enjoy every moment of their stay at the farmhouse Guest Cottage . . . The words artistic, creative, skilled come to mind . . . Wonderful "after" photos, Trina. I love that you find such amazing deals. $20 for that great plant stand (did it come with the marble top? ), and $30 for that sweet nightstand? Amazing. Looking forward to seeing the outside photos. Such a sweet space! I am madly "pinning" everything! 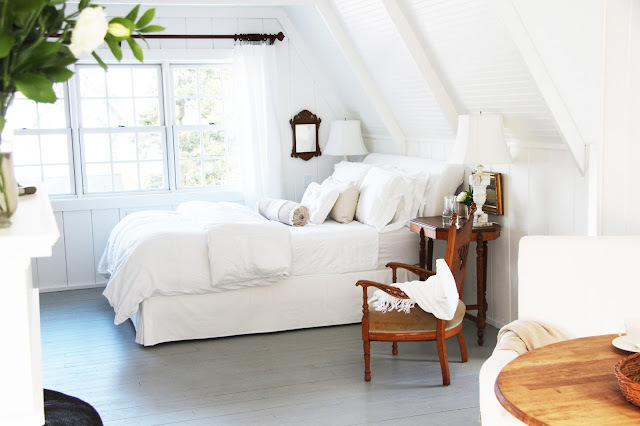 I've always dreamed of a little guest cottage and this is exactly what I would want it to look like! Beautiful! I would love to be a guest in this lovely, charming and restful space. Who could ever get tired of hearing about & seeing photos of your beautiful guest house! It is absolutely beautiful! I am jealous for the guests who get to stay there. Please keep us updated on any other renovations/design projects you do. We NEVER tire of them! If I were your guest, I'd never leave! I have thoroughly enjoyed the process! Is your husband a builder? Does he have a full-time job? It just seems like this must have taken every spare second. I am lucky to have a VERy talented husband to keep costs down. Everything looks wonderful! I could move right in! = ) I hope you have a great day! You have impeccable taste in all you do. One question...how do you keep everything white? I can't imagine having it stay that way around here. It is all so utterly gorgeous. What a serene, calm, special place to house a guest. Perfection. You certainly have not overposted about the guest house. I am enjoying every little detail and taking them all in since we hope to build a tiny cabin. I love that you have made it charming while working within a budget. As a lover of antiques, I'm delighted you used old things too. Just Curious... this guest house, is this something for friends and family type guests? or is this something that you'll be renting out for weekend getaways...because, MAN! Stunning. Everything you do has such style and is always edited very carefully. How does one book a night there? I would love to come be a guest at your beautiful guest house! You can never have too many pictures of something beautiful! As with the rest of your home, your guest house is remarkable. So warm and cozy, and yet it's clean, fresh and timeless. Love everything about it. I'm looking for a small new home in LA...what I wouldn't give to find a great space like this! Oh, I love this tour. 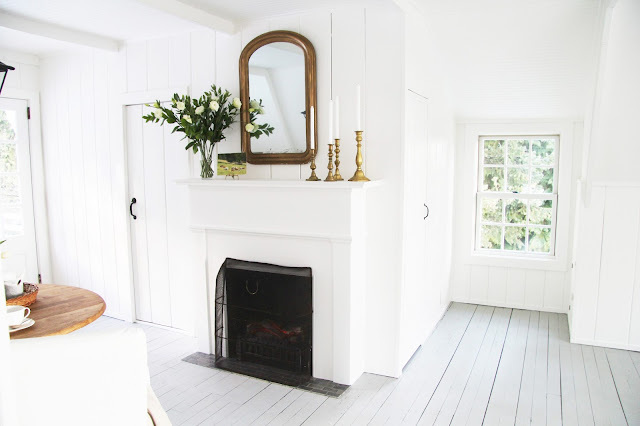 the colors of the wood and all the white is so charming. I would love to stay at such a peaceful looking place. Looks amazing. I would be super happy to stay here. Hey, I'd be super happy to LIVE here! Pat, Just family and friends stay there. It had been used as a rental by the previous owners but we're not interested in renting it out. My mom stays there the most! A, Silver clock is something I found new several years ago. I would like another one but haven't had a moment to do a search. ND, Mike has a full time job, yes. He worked on the guest house on weekends and sometimes after dinner on the weekdays. We also hired out some help for several things. Claudia, YES! Marble was included with plant stand. What a deal huh? I found it at Monticello Antique Mall in Portland. Lori, The slipcovers are washable (headboard included) but they really don't get dirty easily. I don't find white to be a hard color to keep clean. If I didn't paint things white, they would be another light color so it wouldn't make much of a difference. everything you do in your house is so beautiful that I can barely stand it. It looks lovely!!!! I don't know if it's just my computor screen but I'm having a bear of a time seeing details because I'm not seeing much contrast because of the white and maybe it was a bright sunny day with the pictures were taken. Could you maybe take a picture of the kitchen and mantel in a softer light? I love your ideas and don't want to miss any!!!!! Don't take a break! I've been enjoying these posts so much and found much needed inspiration to finish up some projects of our own. So looking forward to the exterior. Speaking for myself (and, apparently, others) you could never "talk too much" about your beautiful home and how you and Mike have acheived the renovations you've done. Although, yes, I look forward to twin posts, too! This is such a wonderful space! Lucky the guest that gets to spend some time here! Oh, I was so excited when I saw this pop up this morning! Only thing I can think to say about your guest house: Completely stunning. And I think I can speak for most of us when I say, we most certainly are NOT tired of hearing about your reno (this one or any other for that matter!) so please keeping them coming. Your sense style is so lovely and peaceful I could look at it all day. Take Care. Trina, your guest house is elegant, beautiful and warm. What a treat for guests! I love your thrifty finds and how you've used the things you love in this renovation. 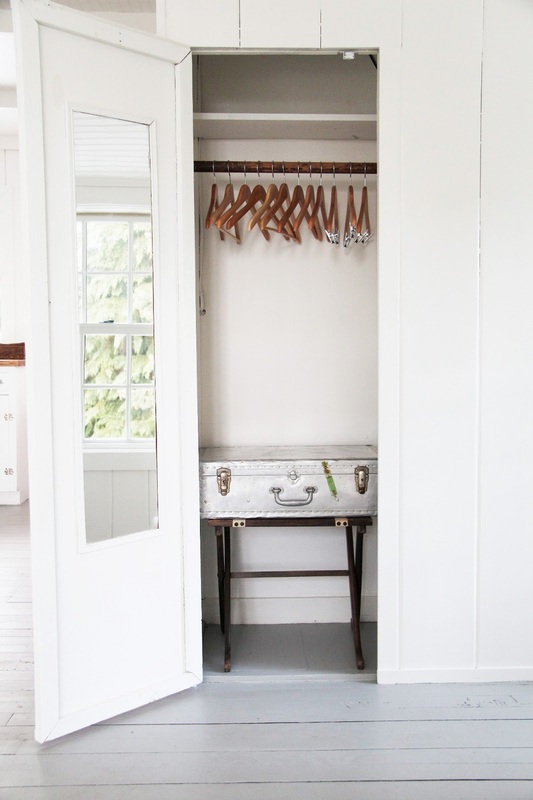 I could never tire of your posts and have loved reading the details behind the renovation... I can't wait to read about the exterior. Also, your photos are beautiful! I would never tire of hearing the details on your home. This guesthouse is perfect! I am so glad you even showed the little bathroom. It is lovely, too. You have such a well defined style. I think the Country Living article could have been a little longer! I know I love seeing your touches and changes and the renovation bit by bit. I love it. I never get tired of seeing what lovely things you and Mike have done to make your house a home. Love it. So absolutely beautiful. What a beautiful, beautiful space. I would live there in a heart beat... Too bad my 4 children wouldn't fit in there! You and your hubby did a fantastic job! Talk away! I have so enjoyed the posts and your detailed explanations. My husband, Glenn, is very handy, like Mike. He has done so many things for our different homes over the years, and I have always been grateful for his abilities. I think one of the things I especially like about your style is how soothing it is, yet graceful and elegant at the same time. Thank you for sharing with us. Have a great day with the twins! Trish - what kind of paint to you use for inside? A flat white? It looks so clean and fresh. I have loved every detail of this photo shoot! Don't stop. Your vision is fantastic!!! Of course I want the Ikea chairs that are no longer available... Murphy's Law;) My husband would say that I collect mirrors too. 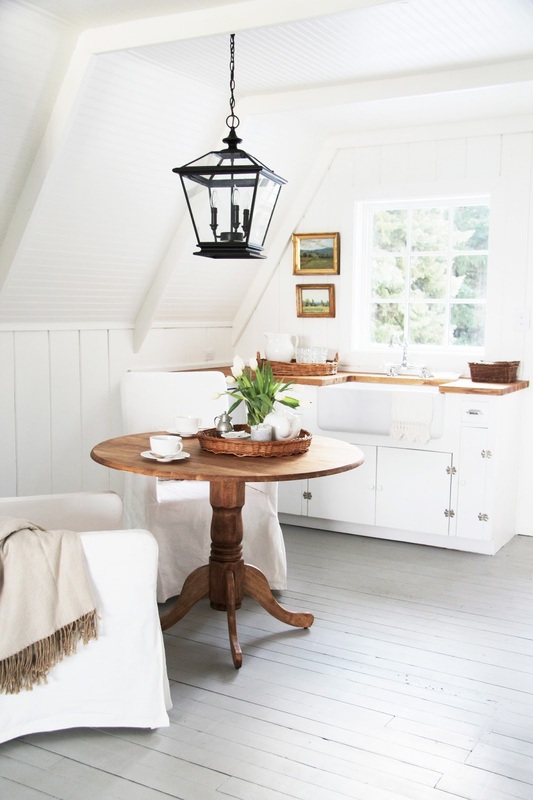 The inside is painted in Simply White by Benjamin Moore in eggshell finish. Stunning! Your style is so precise - one would think this was a room in your house. I lvoe all the elements and I am always amazed at your eye for great (cheap) pieces! Married with your innate style, it all goes beautifully! P.S.2: I am booking the next flight to Portland (is that close?) and will be there in time for supper. I was wondering why this looked so familiar, it's in my Country Living magazine! CONGRATULATIONS! What a fabulous honour and you deserve it! 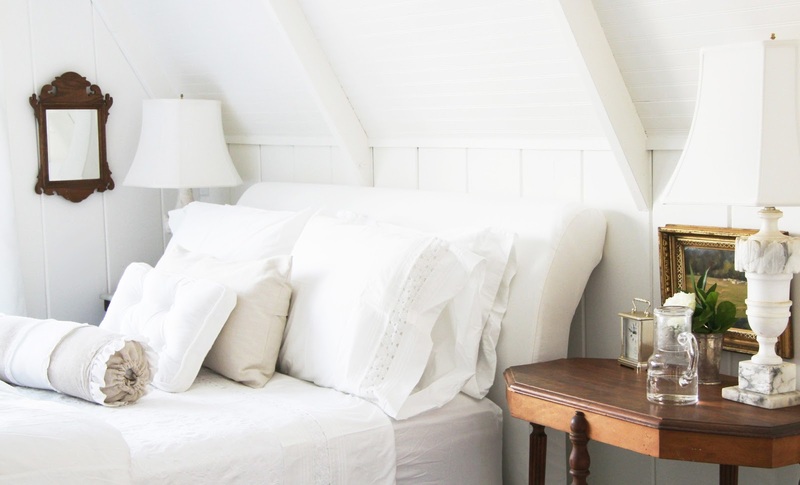 You are a very good decorator, I love the simple style and your use of white, it's really nice. Actually, after fixing up the guest house I suggested to Mike that we lighten all the wood in the main house! I do prefer the lighter wood tones, they do seem warmer. As far as paint goes, I think I'll always be a neutral girl. It stands the test of time for me. I imagine over time, hopefully, to just evolve with more art work, finer antiques, etc. I have been contemplating the natural fiber rugs as they haven't held up well with our sweet babes (even a water spill will stain jute). So perhaps wool is in our future. Wow Trina- Just catching up on all of these posts and I am thoroughly stunned. This is absolutely gorgeous! Bravo my friend. Absolutely beautiful! And post more pictures anytime, we are defintely not tired of them! This is such a beautiful transformation. I will join in with the others that I am not tired of hearing about it. It makes me want to purge my stuff and start anew! You have done a wonderful job. All of the white allows the wood and art to really pop. Your family and friends are quite the lucky guests. Would you mind sharing the artist of the painting above the night stand? thank you so very much for the sources!! Absolutely love the whole renovation! It has been a pleasure reading about your guest house renovation - thank you for these posts! The exterior bit is welcome too. That is Cathleen Rehfeld as well. This is so beautiful...so Trina. Your style is certainly your brand. If I saw these photos without the banner of your blog, I would still guess they were yours. I just LOVE the clean, beautiful look of white...this and the new trend with subway tiles in kitchens and bath, so gorgeous to me! Trina...I just love this whole post!!! I think all the good adjectives have already been used up, but I can't resist saying that the combination of whites and warm wood tones with little touches of fresh green just makes me feel so happy :) Thank you for the glorious inspiration. So beautiful. 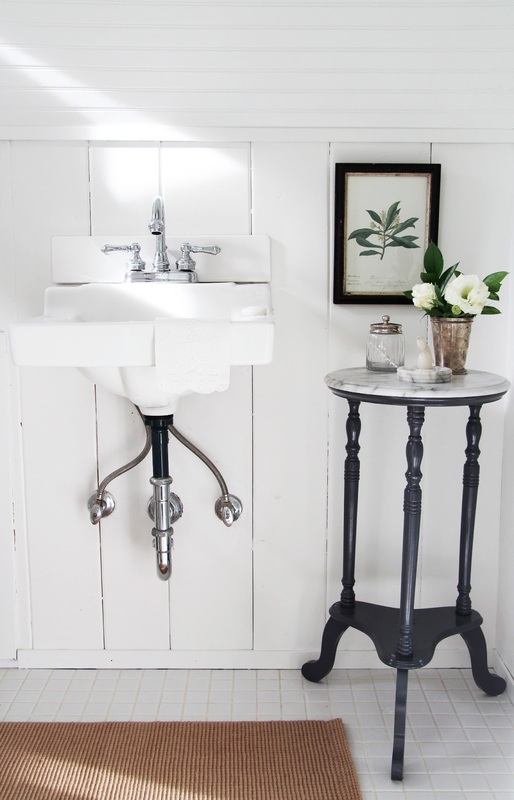 Love, love, love the farmhouse style! What a treat to see the details...see around the corners etc. So beautiful. Lucky one who gets to guest there! Such a beautiful space! I so appreciate seeing all of the details and the process that you've gone through to create the final look. I featured your blog at stylesson today - thanks for all of the blog posts showing all the behind-the-scenes details. You have such a beautiful way of decorating! I love to see your work. Is the mirror over the mantel an antique? If so, I can't believe you found it for such an affordable price! Inspiring! You have wonderful vision for "what can be". Hope you don't mind if I PIN IT! Lovely!!! What an amazing transformation. Love the simplicity of it all, which takes a trained eye to create. Kudos to you and your husband on a job well done! Would you mind sharing the source for the electric log set? I just bought a tiny 1920s condo and am thinking about "amping up" the charm factor with a faux fireplace. I have a faux fireplace in my home. Would you mind sharing the information about the electric logs? Do they actually provide some warmth? Oh my word...this is the most perfect guest house I have ever seen. Don't mean to be rude, but could I invite myself for a night or ten? Your style is stunning!!! Oh my! What is you address?? I'm on my way!! I want to be the first guest!! Gorgeous!! Simply gorgeous!!!!! Hello from England! I have so enjoyed the progress to your charming guest cottage - you have done it so beautifully! We have a building in our grounds that I would love to convert next year in to a guest cottage too - this has been so inspiring! Thank you. Vicki, Yes the mirror is an antique and has a lot of imperfections, which you can't see in the photos. It was indeed a wonderful find. Ami, I looked at White Dove. It's used quite a lot by interior designers, etc. I think it's a good choice! I believe it heats up to 400 square feet, which is what our guest house is roughly. So it was a good fit for us! Not at all tired of hearing about it, and definitely looking forward to outdoor pictures in the spring! The IKEA bed looks luxurious and I'd never have guessed from the pictures that it was a last-minute purchase. What an incredible job Mike did on that darling fireplace, especially considering that he had to get all this done after hours or on weekends. I will keep that tip about jute in mind; had no idea that it stained easily. Thank you so much for sharing! I can't stop looking at this amazing transformation. Wow, I love it. It really motivates me to finish our upstairs area, which will be designated for a playroom. We also have the paneling that I want to paint. Im wondering did you prime it first? Sand it? Any tips welcome. I looked through your previous posts but didn't see this addressed, unless I looked over it. You made my morning! Such a lovely virtual visit to a wonderful space! I'd luv to stay there too! Your mum is one lucky lady! No! Please don't take a break from the guest house posts! I have been savoring each one of these photos. I would love to see the view of the bathroom from the shower looking out. And I can't wait to see the exterior shots. Soon, please! I'm not at all tired of hearing about the guest house. It's been nice to have more frequent posts, as your blog is one of my favourites! Your attention to every detail shows how much you care about the people that will use your guest house. Trina, Please...I need kitchen faucet details! haha Did I miss that somewhere in the kitchen post? I love it! The guest house is gorgeous! Perfection! Thanks! Robyn C.
Trina, so beautiful, simple and fresh. It's such a pretty, welcoming space I'm sure your guests will have trouble leaving. As far as the old wood paneled walls, we primed and painted right over it (we did that years ago). The unfinished wainscot we put on the ceiling was primed and painted as well. Do you mean the walls or the ceiling? The walls are real wood panels that fit together with grooves. It's very old school and they look so great painted - so dated stained (and so cabin-like). As far as the wainscot ceiling panels, that's what the lumber yard had on hand so that's what we worked with! I'm not very fond of fake fireplaces but you guys have really pulled it off nicely. Shame its not a real one. ok i am so going to need the name of those fireplace tiles you used! love them!!!! Oh.my.lovely! Should I start packing for my visit? Can I bring 4 kids, a dog and a husband? Simply lovely. 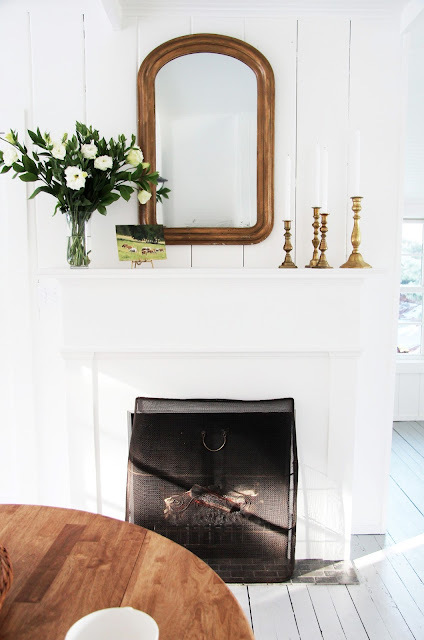 Favorites: fire screen and bedside table. Very nice. In the most special, perfect, sweet and simple ways, this is absolutely spectacular. You have perfected white and designing this space with all your imagined changes...well, it is so welcoming. The fireplace is the coupe de grace...Grace, that's it...Grace Cottage! Congrats to Mr. ACF! Job well done! I found a picture of your guest house on Pinterest. I immediately jumped over to your blog and have been pouring over all the pictures of your home. They are so lovely and inspiring! Thank you for sharing. Just as amazing as I thought it would be! Your guests are very lucky! Your guest house looks like the setting of a fairy tale. Almost not enough complimentary adjectives to use for this glorious cottage. I love the oil paintings, the tables, the mirror..... Just wonderful! Just beautiful! I appreciate all your pictures - honestly when I came across the feature in CL I was a bit disappointed - I wanted more! :) I love the mirror over the fireplace. Just beautiful. I'm just loving every inch of your guest house...it's so beautiful! Please don't take a break...show us the outside! I have been following your blog for awhile, and am finally taking the time to write. First of all, your taste in so many things is just wonderful! Beginning with your son's name! I have a Graham, too! The guest house is stunning!! I am having such fun going back, reading your old posts!! 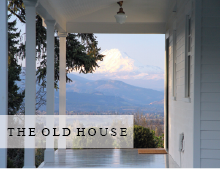 I've really enjoyed reading about the guest house renovation. I give you lots of credit for doing things in a cost-effective way, and think the addition of the heat-generating fake fireplace is genius. It gives the space some gravitas and adds such a strong focal point. One question: I know you styled the space for photographs for the blog rather than practicality, and therefore everything was styled to be very pristine, but do you anticipate adding some practical items like a heating (burner)element in the kitchen? A microwave, etc? And if so, will you show us how you handle these? I think it looks great. Thanks for sharing it with us. Well done! So fun to follow your blog and watch your 'lil cutie patooties grow. Your photgraphs are always brilliant! 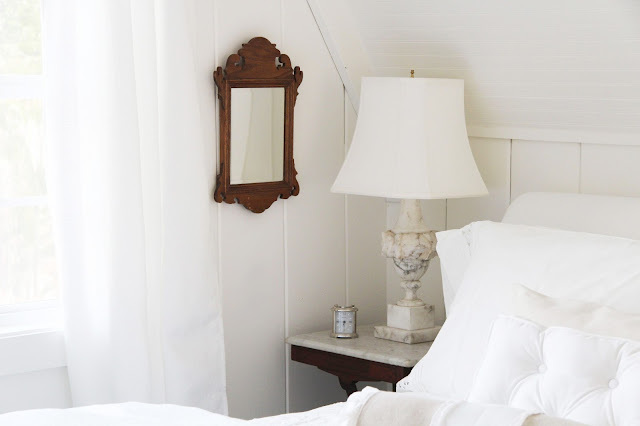 What a beautiful guestroom. Guesthouse. I really love your style. You give me a lot of ideas. white on white is ever chic! loved it! Hi, I'm a lurker and am forever inspired by your inimitable style... and your lovely life, too. I have just one request- and please take it as a compliment-- I think you could do with a better headshot (? is that what they're called?) of you and Mike. It's just that I know you guys are both so gorgeous and the pic you have doesn't reflect that, or your personalities (yes, I kind of know you guys, but will remain anonymous, b/c I do know this is a rather rude request). Just do your beautiful selves some justice! And now please forgive me! Very cozy and elegant. Well thought out. Fantastic transformation. Love the light floors. Combien de metre carré dans cette piece ? Ciao, as an architect and a country-style-addict, I really love your blog! This may have already been asked, but what is the finish you used on the pedestal table? It is exactly the result I would like to have. And, the guest house is amazing! I love all the behind the scenes posts!! We are doing an attic space in our 1860's farmhouse and it was ironic that your article came out smack dab in the middle of our project. People think I'm crazy as I had our windows restored in the attic. It makes all the difference in the world to do things right--the first time! Love your space!! I don't know how I stumbled across your blog...but I have been sitting here for a few hours soaking it up. I love your transformation photos. Please tell your hubby that he is a GOOD MAN to do all that work. We have built several houses and remodeled a foreclosure and it is so stressful! I love your positive attitude! May you have a blessed life in your Country Farmhouse! Your guest house is gorgeous! That was an absolutely stunning tour of your guest house. Just beautiful. It has been on my 'to do' list to update our picture! The photo I'm using was the only recent photo I could find of us. Perhaps this weekend we'll do it? Love this!!! The warm wood hues with the crisp white looks fantastic! And I envy your mirror collection. My husband claims I have a huge one....but I think you have me beat. Trina, Your blog is one of my favorites and I love your style. I was wondering if you are happy with your washed jute rug from Home Decorators? I am trying to decide between PB seagrass and the washed jute. Would really like to get your feedback on the rugs. Thank you!! Seagrass it is then...Thank you for your prompt reply!! This is absolutely stunning. Most have a fear of color. I have a fear of white. You've inspired me to get outside of my comfort zone. Thank you! It's gorgeous! Your home is such an inspiration! My husband and I recently found a little farmhouse to call our own. We have a lot of work to do yet but planning is half the fun! I hope it turns out half as beautiful as yours! Your guest house is an inspiration!!! We have a 1870 farm house in Texas and now need to expand. Yours is perfect!!!! Also saw it in Country Living.....I bet you were thrilled. All lovely Trina...very CL worthy, congratulations! Hope there weren't very many 'of courses'! I have enjoyed reading this blog. All images are also awesome. I really appreciate this. I'm still looking for the post of luxurious guest house Birr. Thanks! This is so beautiful!! 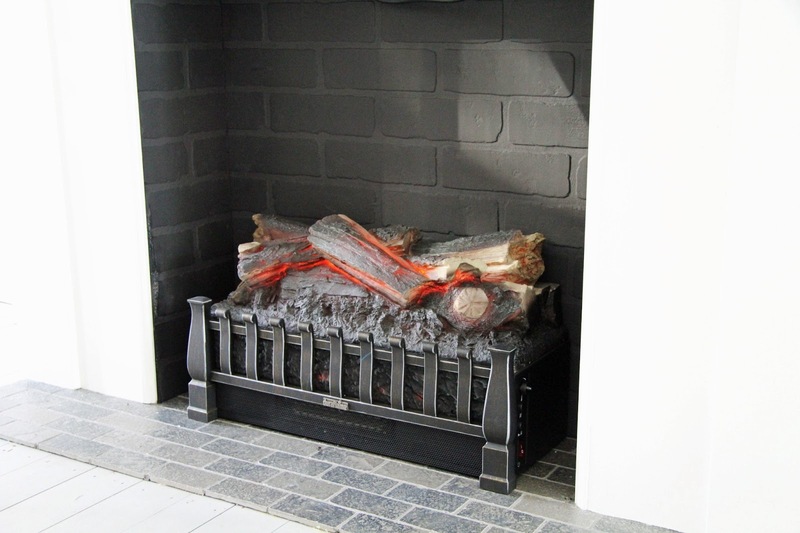 Do you know the name of the tile/manufacturer you used for the fireplace hearth? I'm having trouble finding it. Thanks! What a beautiful transformation! I can't get over how wonderful everything looks. 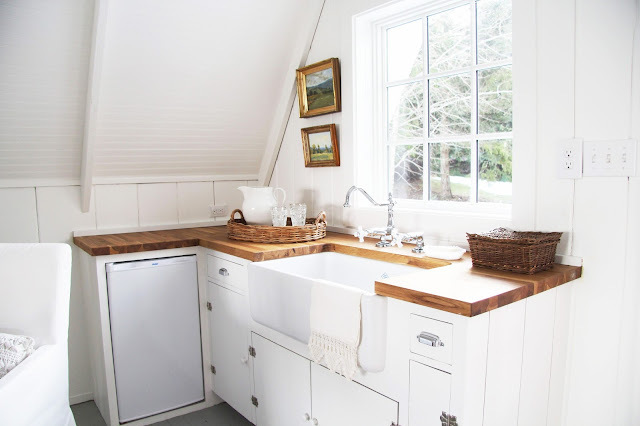 I love the oak butcher block counters! Trina, your pale-gray painted wood floors are stunning. They are exactly what I've envisioned for my New York City kitchen. Thanks for the inspiration . . . you've given me the "courage" to paint my kitchen floor. You have exquisite taste and a magic touch. Thank you for sharing your home with us. I have 18 month old twins who have been sick for 7 days (Merry Christmas!). I haven't left my house once, all week! Finding your blog has been my only salvation - other than my husband's return from work in the evening. I thank the sickness gods for making the twins take longer naps so that I may escape into your blog! BUT! ... You've given me mirror envy. I can't tell you how many years I've searched for a rustic, patinated Louis Phillipe-style mirror. It seems you have TWO! Anytime I come across one, they are too many hundreds of dollars and you say you scored one for $35?? HOW??? Do they go by another name? I have even set up alerts for "Louis Phillipe mirror." Would you share the name of some of the antique markets you visit? Thank you for sharing the holidays with me. Your homes are beautiful! I love the lower inside shutters on your newest home. You've done such a beautiful job! Could you share what color paint you used on the floors? Amazing house where I could live happily forever. I know Ikea no longer makes that bed, but can you tell me what the model name? I am so sorry but I do not recall. IKEA customer service may be able to tell you. Good luck! I love your decorating style. I am preparing to install the same counters from IKEA in our beach cottage. Would your hubby recommend cutting them on an angle in the corner where the two slabs meet or butting them at a 90 degree angle? Thanks for the help! Mike says that they typically recommend butting them in because they expand and contract seasonally - which is what we did in the guest house but not in our kitchen. Best of luck! I would love to stay at guest house which provides perfect comfort and good food, It seems here I will find all. Absolutely beautiful home! I love everything about it! It's so calming and peaceful! I would love to try to make a table like the one you did. Would you be willing to share the stain and seal you ended up using?